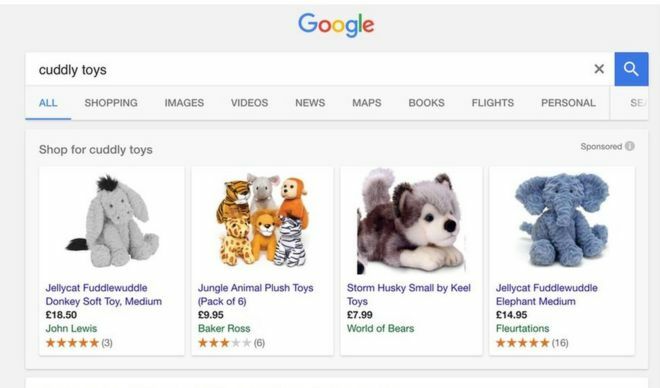 Google has been fined 2.42bn euros ($2.7bn; £2.1bn) by the European Commission after it ruled the company had abused its power by promoting its own shopping comparison service at the top of search results. The amount is the regulator's largest penalty to date against a company accused of distorting the market. However, if it fails to change the way it operates the Shopping service within the three-month deadline, it could be forced to make payments of 5% of its parent company Alphabet's average daily worldwide earnings. Based on the company's most recent financial report, that amounts to about $14m a day. "What Google has done is illegal under EU antitrust rules," declared Margrethe Vestager, the European Union's Competition Commissioner. Google had previously suggested that Amazon and eBay have more influence over the public's spending habits and has again said it does not accept the claims made against it. "When you shop online, you want to find the products you're looking for quickly and easily," a spokesman said in response to the ruling. However, one of the other original complainants - the British price comparison service Foundem - welcomed the announcement. "Although the record-breaking 2.42bn euro fine is likely to dominate the headlines, the prohibition of Google's immensely harmful search manipulation practices is far more important," said its chief executive Shivaun Raff. "For well over a decade, Google's search engine has played a decisive role in determining what most of us read, use and purchase online. Left unchecked, there are few limits to this gatekeeper power." This is a big moment in a clash between the EU and the US's tech giants, which has been going on for more than a decade. The commission believes it has struck a blow for consumers and for little firms at a time when online advertising - particularly on mobile phones - is dominated by Google and Facebook. Google believes the regulator has a weak case and has failed to provide evidence that either consumers or rivals have been harmed. In essence, it sees this as a political move rather than one based on competition law. You can be pretty confident that the Trump administration will share that view. There's mounting anxiety in European capitals about something called Gafa - Google, Apple, Facebook and Amazon - the four American giants that play such a huge role in all of our lives. That means we can expect further action to try to limit their powers, with the potential for growing political tension between Brussels and Washington.